New Life Church is a Christian church that worships the Lord Jesus Christ, preaches the Gospel Message from the Word of God, prays for the sick and believes God for people to be healed, saved and delivered. Sunday Morning Worship service is at 10:00 a.m. with Faith Case Children's Church following Praise & Worship. We are blessed to have the dance team "Commissioned" worship the Lord through prophetic dance Sunday mornings. Wednesday night at 7:00 p.m. is Bible Study night for adults, youth, teens, tweens, and children. 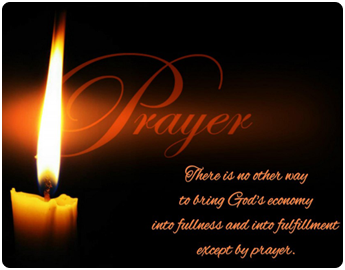 Join us every Friday night at 7:00 p.m. for a powerful hour of corporate intercessory prayer. New Life Church honors the Lord's designation of his house to be called a "house of prayer" (Is. 56:7, Mat. 21:13). The church community gathers on Friday nights to pray for the needs of the church, the city, and the nation. We do this, ultimately, for salvation and revival of mankind, as well as for the increased manifestation of the Holy Spirit. At this strategic hour, the Holy Spirit is awakening a global prayer emphasis unlike that of any other in history. As this type of contending prayer and intercession intensifies, the church of the Lord, Jesus Christ, will become increasingly tuned into the Father's heart. This is for the glory of His Son to fill the earth, one redeemed soul at a time. One of the byproducts of intercessory prayer is a church that takes its place as the hands and feet of Jesus on earth, receiving the inheritance promised by the Father to the Son: "the nations" and the "ends of the earth." (Ps. 2:8). We are located at the old Loehmann's Plaza. Friday Night Prayer: 7:00 p.m.